Escape the cubicle jungle! Be your own boss! Travel the world! These are the refrains of most digital nomad preachers. But if you’re already freelancing or consulting (as many of us are in this gig economy), you’re already most of the way there. So what now? You don’t need start-up advice, you need a nudge (or perhaps an invitation?). 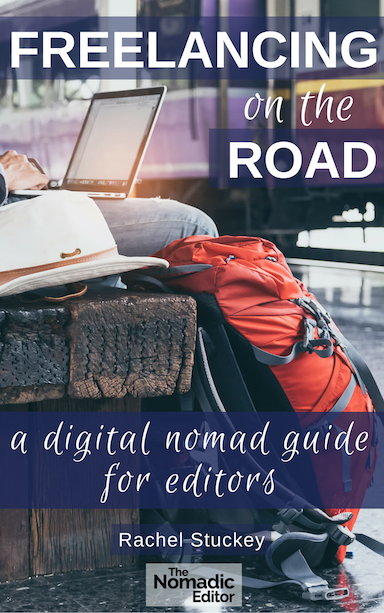 Freelancing on the Road explores the ups and downs of #digitalnomadlife from the perspective of a freelance editor, providing helpful advice and guidance for editors and writers, as well as designers or consultants, and anyone else who earns their keep by freelancing. How do you go from freelancing in your home office to freelancing on the road? What is working and living as a digital nomad like when you aren’t a twenty-something tech entrepreneur? And what about the fine print that comes with living a glorious Instagram life? In this book, the Nomadic Editor discusses both the dream and the reality of becoming a digital nomad freelancer. Available now for Amazon Kindle!